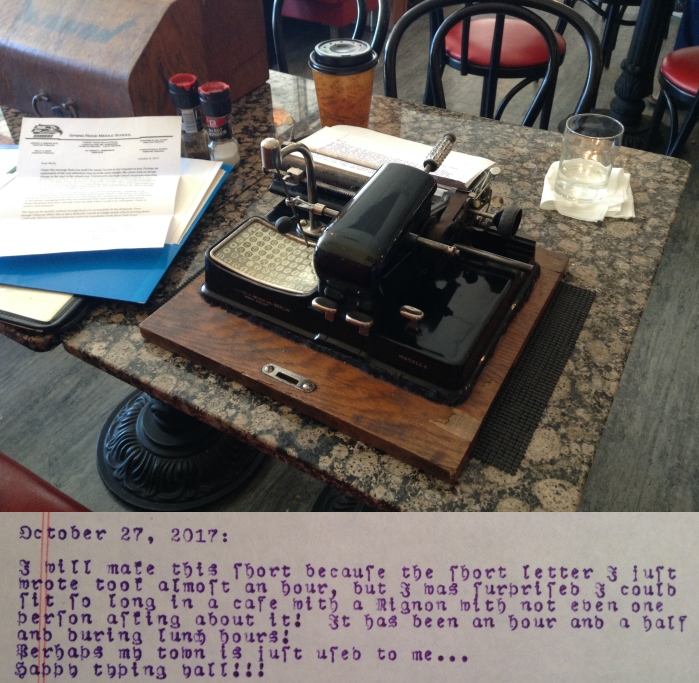 I tried it again during dinner, writing a second letter to a second friend, and actually met some really cool people including one who has about 10 typewriters himself and is a bit of a collector. It's nice not to be interrupted so much, but with this machine I felt like I was totally asking for it!!! You're a madman. A glorious madman. What other machines are you thinking of taking in the future? Today I am taking it easy and just bringing an Erika. Yes quite mad. But the perfect machine for some Edgar Allen Poe-inspired poetry! That typewriter should have drawn a great deal of attention. Using it at home should be fun. In public, I agree, mad. But it had to be fun. Great old typeface though. Hmm, the only way I can match that is a Smith-Corona Coronet Automatic 12. Plugged into the nearest outlet because "I need to charge it." The power return of the carriage would be enough to annoy any barista in mid-pour. Hillarious! I'm sure most people didn't even recognize this as a typewriter. I'm amazed you were not arrested for using a foreign spy machine in public. You know 'if you see something - say something'.